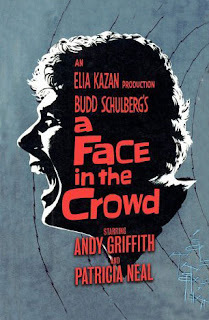 Fourth Row Center: Film Writings by Jason Bailey: Backfilling: "A Face in the Crowd"
Rhodes (Andy Griffith) is discovered in an Arkansas jail by radio producer Marcia Jeffries (Patricia Neal), who puts the folksy singer/jokester on the local airwaves. His later ruthlessness is glimpsed early, in the efficiency with which he dispenses of his “manager”; with Jeffries by his side, he ascends to local television and then to the national airwaves, where, though he continues to shake his head and shrug, “Aw, shucks, I’m just a country boy,” he becomes a more dangerous—and power-hungry—voice of an increasingly less common man. Kazan’s direction is in line with the sweaty, atmospheric vibe of his Streetcar Named Desire, while managing to replicate the expert blend of high drama and high-falutin’ social commentary of their previous collaboration, On the Waterfront. As Rhodes, Andy Griffith is simply electrifying; now that he has worked his way into our collective comfort food conscious, after the folksy charm of Andy Taylor and Ben Matlock, it packs a wallop to watch him in this kind of a roughneck role, oily and self-congratulatory and dark and power-hungry. Neal overacts a bit in the third act (which itself is a bit overlong and overheated), but a young Walter Matthau (and Jesus, Matthau even looked old when he was young) proves a wonderfully bitter underling. “I’ll say one thing for him,” Matthau notes, late in the film. “He’s got the courage of his ignorance.” Indeed. Sometimes films that predict the future are way off (see: just about any film about future technology or civilization), but sometimes, an intelligent and clear-thinking screenwriter will hazard a guess as to where we could go in mass media, and absolutely nail it. As you watch A Face in the Crowd’s seemingly far-fetched television opinion show, “Lonesome Rhodes’s Cracker Barrel,” in which Rhodes and his buddy sit around, espousing jingoism as homespun wisdom and using that bully pulpit to push repurposed political candidates, I couldn’t help but think about how easily that show would fit in on Fox News.